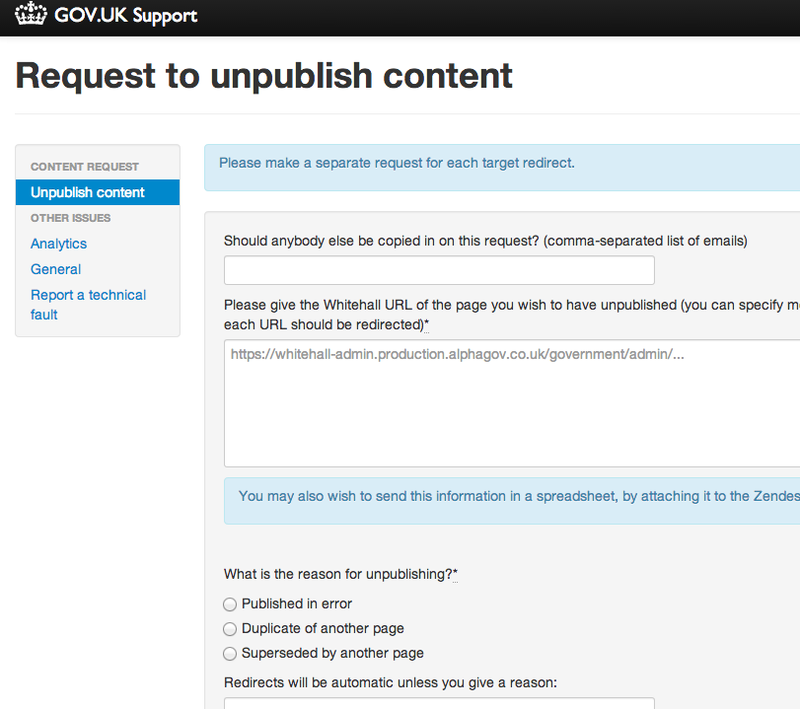 I am a member of the GOV.UK User Support team, responsible for improving the [government-only] support form (found at https://www.gov.uk/support/internal). Back in April, we described the process for removing content from the frontend. To make this process easier, we have now added an 'Unpublish content' section. From now on, please submit all unpublish requests through the new section (and not through the 'general' section). The new section captures all the necessary information that GDS needs to unpublish (and thus avoids unnecessary delay in clarifying the details), and routes the request directly to the right team (again avoiding unnecessary delays). Very clear blog and I find the new process very easy to use - thank you! Departments really need to be able to unpublish their own content - when we've discussed this at the operations meeting there was an overwhelming consensus that we need this urgently. Yes, we agree and it is on the roadmap. We will deliver that feature as soon as we are able. I hope to do so in the coming month to month-and-a-half. There are a number of things that we need to do before we can roll it out. See the stories tagged "self-service unpublishing" in Pivotal. Thanks Neil, that's good to know!